Something tells me that you organized cooks out there are in the midst of planning your Easter and Passover menus. Am I right? My mom had me on the phone the other day trying to get side dish suggestions for her traditional Easter leg of lamb. After I spoke with her, I took a call from my mother-in-law to go over her Passover menu. This year we’ll be staying in California for the holidays and I’m on dessert duty. I’ll be making lots of coconut macaroons, my traditional lemon ice torte and a raw cashew cheesecake that I’m obsessed with. But if I were hosting Easter or Passover at my home (not that there’s anything wrong with lamb and brisket), I would make this Baked Chicken with Artichokes and Capers. Normally, I don’t post a recipe until after I have finished teaching it, but I am just so excited about this chicken I can’t wait another day. It might be my favorite chicken recipe to date, which says a lot since I prepare chicken quite often. This dish has it all — great flavor, ease of preparation, healthfulness and seasonality. But really chicken isn’t even the star of this show. 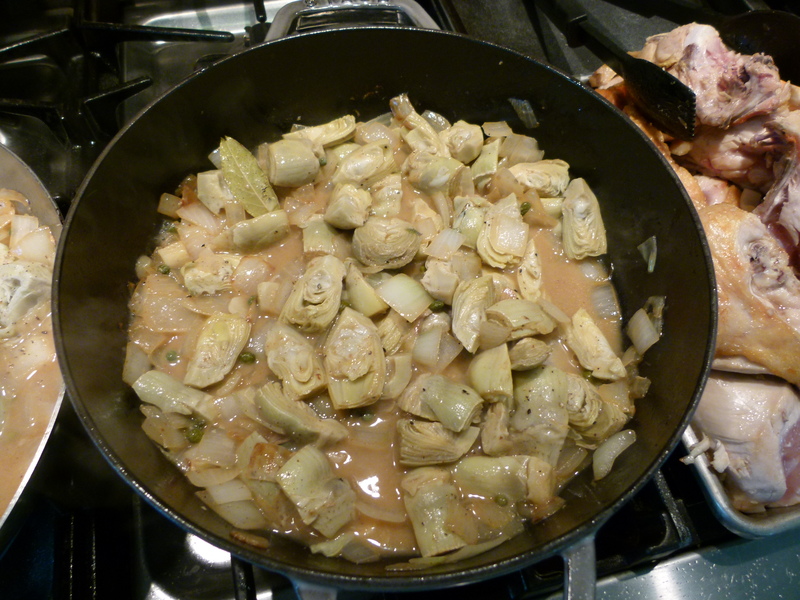 I actually came up with this recipe to work around one of my favorite springtime vegetables, artichokes. I am going to cheat a little here. There are times when DIY is the way to go, as in chicken stock. And there are times when there is not enough patience in the world that could get me through trimming the number of artichokes it would take to fill this saute pan. (Although I am the same person that trimmed 10 pounds of Brussels sprout leaves for Christmas Eve dinner.) What’s different about this situation is that Trader Joe’s has come to my rescue with frozen artichoke hearts, an absolute gift and an affordable one, too. Not only do I always have a bag in my freezer at all times, but the other ingredients here are pantry staples, too — capers, white wine, bay leaves, mustard, which are all delicious with artichokes. You may have followed similar recipes for chicken and dredged the chicken in flour first before browning it. The flour does help to the thicken the sauce a bit, but we can avoid the dredging altogether by adding the mustard to the sauce, which gives great flavor, as well as some body. 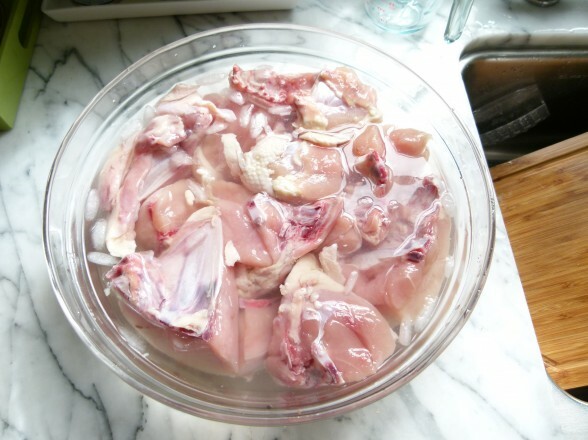 Be sure to read my latest post on the secret to great-tasting chicken and you can decide if you want to salt the pieces or soak them in a wet brine. Both ways are very easy and definitely worth doing. Please note in that post that kosher chicken should not be salted or brined since it has already gone through a salting process. To make this recipe with boneless, skinless pieces, check out my recipe for Lemon-Thyme Chicken and follow those steps. For a winner spring holiday lunch or dinner, pair this chicken with this asparagus salad or minted sugar snap peas, and some roasted new potatoes. I have a seriously fabulous vegan and gluten-free coconut tart coming your way soon! Preheat oven to 375 degrees. Remove chicken from brine and pat dry with paper towels. 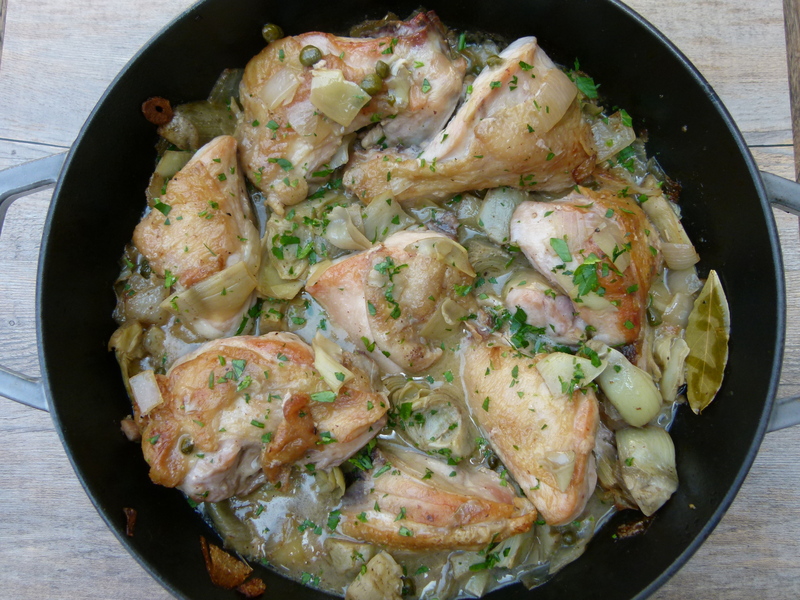 In an ovenproof skillet or braising pan, over medium heat, add the oil. Brown chicken on both sides. Transfer to a plate and reserve. Add onions to skillet and cook until tender, about 8 minutes. Add garlic, salt and pepper and sauté another minute or two. 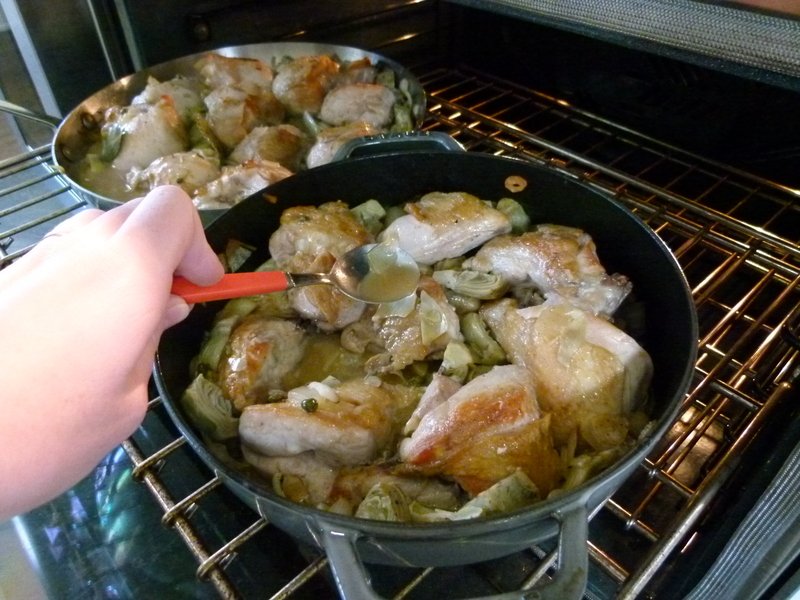 Carefully add wine to pan, and deglaze by scraping any brown bits on the bottom. Add chicken, bay leaves, artichoke hearts, capers, mustard and stock to pan and bring to a boil. Place in oven for 30-35 minutes, until chicken is cooked through, basting after 15 minutes. Garnish with fresh chopped parsley, if available. Would you suggest covering the pan while the chicken cooks? I have made so many (and loved so many) of your recipes but this might be my favorite!! It was so amazing. We made it for my parents and it was a big hit all around. I already can’t wait to make it again. Different than anything in our repertoire but such a great combination of flavors. Thank you so much!! Wow, so excited to hear this! Thank you, Jenny! I think I should have browned the chicken a little bit more but other than that, I loved this really easy and delicious chicken. I love the flavor of capers. I used your recipe and made cauliflower rice with it. Yummy! Mmmm, good call serving this with cauli-rice! Brined my kosher chicken for an hour. Then read the comments to see if anyone had any suggestions before I cooked the rest of the dish and saw the guidance that kosher chicken is already brined. Pamela mentioned this was a good point to add to the original recipe but never did it. Wish I knew. Yielded an extremely salty dish that we couldn’t really remedy since the chicken was inedible. Disappointed. I am so sorry. I understand your disappointment. Kosher chicken should never be salted or brined since it has already been through a salting process. Unfortunately, I changed plug-ins for the recipes on the site and many of the “notes” at the bottom of the recipes were dropped. I will add this one now. I am in the process of buying new pots, pans, etc. What type of skillet/pan (brand, material, etc.) do you like to brown chicken? I do not have a good one that browns well…. BTW – This is a great dinner! Just made it tonight. Have not made it for a couple of months. I made this on Tues.for 2 people to try out for Passover and it was great. My question is – I need to make it in quantity for seder – I’m having 30 people, I don’t have enough skillets for that amount of chicken. Can I use my stainless roasting pans to brown and then bake (they are All clad so can go from stove to oven). Would using roasting pans affect the cooking process? Thanks. Absolutely fine! No need to adjust cooking time. Also, you can prepare everything stovetop and transfer to ovenproof casserole dishes to bake as another option. Happy Passover! I checked and my Whole Foods didn’t carry frozen artichoke hearts. Is there a certain brand and where do you find those? I did find them at Whole Foods, but Trader Joe’s also carries frozen artichoke hearts. Otherwise, look for jarred artichoke hearts in water and just drain them. No problem! Thank you! I also would love a couple of pan suggestions that go from gas stove to oven. So yummy and so easy. I added some lemons and it was terrific. Thanks, Pamela! Mmmm….lemons are the perfect addition! This was very oily for me. I think I’d like a version with chicken that wasn’t fried first. I’d just brown the onions and garlic in a bit of oil and bake the chicken. Maybe bone in chicken breasts would be better. I used all thighs and they hide a lot of fat, especially with the skins on. A very flavorful dish though. I served with egg noodles. It was just a bit heavy. I appreciate your feedback, Stacy! I haven’t tried this with all thighs, but that could be why it turned out oily. Thighs do have little pockets of fat tucked in them. Since you liked the flavor of the dish, give it another try with breasts. Hope it turns out well for you! 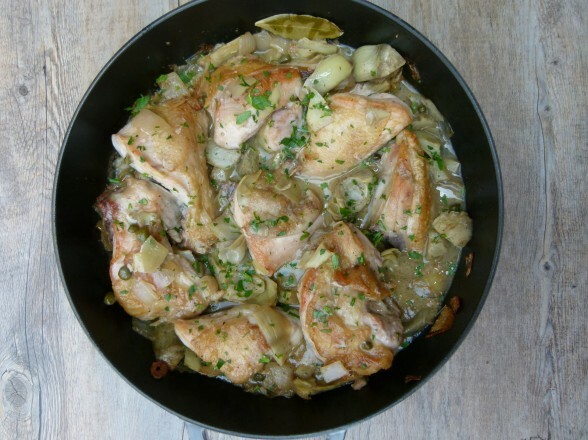 Looks great….do you need to brine chicken if using kosher chicken? Thank you, I think I finally found my Passover recipe! My only question is, do you think it will hold up well in a chafing dish? Looking forward to trying this dish very soon! It should hold up well if you brine the chicken. That will give it more of a chance of staying moist. Don’t forget the parsley garnish — it’s pretty. tasty and perfect for Passover! I’m definitely trying this served over angel hair pasta! If I need to do some of this as a “make a day ahead”, where do I stop? Or is it a finish and reheat? Hmmm….I haven’t done this as a do-ahead except prepping the ingredients in advance (chopping onions and measuring everything out) and salting the chicken early. If you absolutely must do this in advance, I think you would just make and reheat. This recipe looks delicious!! I have to try. Question…because I do not drink and never by fermented anything, can the dry white wine be replace with white grape juice?? I know you’ll laugh at this but I know nothing about wine or alcohol….What does the “dry” mean in dry white wine? Is it a powdered form??? (Okay, you can stop “lauging out loud,” but seriously…I do not know!!) THANKS!! I’m so glad you asked these questions, because I am sure someone else out there is wondering the same things! First of all, you can omit the wine and sub 1/4 cup chicken stock and 1 Tablespoon fresh lemon juice for the 1/3 cup white wine. This will help deglaze the pan and get all the flavorful bits off the bottom and into the sauce. You still need the 3/4 cup of chicken stock in the next step. Just because you asked, “dry” wine means not sweet, such as a pinot grigio, sauvignon blanc or chardonnay. I hope you try this recipe! Hi Pamela, this looks delicious. Is there a way to use boneless skinless chicken in the oven? I saw your recommendation to use the pan for the lemon thyme chicken, but I would rather like to have in the oven when guests are over? Less baking time, or it just won’t work this way? Hmmmm, I haven’t tried it with boneless, skinless, but I would follow the basic formula for the Lemon-Thyme Chicken (dredging, browning, removing from pan, sauteeing onions, etc.) and finish in the oven with a little less liquid just until it’s cooked through. You won’t cook nearly as long, keep in mind. If you’re not sure when the chicken’s done, stick a meat thermometer in the center of the thickest breast and make sure it reads 165 degrees. Hope this helps. Please report back if you try it! Really tender and great flavor! I made it too salty the first time ( missed the note about salt in the stock). We will definitely do this again! I can’t believe I waited so long to try this recipe. It was a total hit with the entire family – even my 2 year old loved it – at first she only wanted the artichoke hearts but quickly came around to the chicken! There was not a morsel leftover – amazing!!! I thought the lemon thyme chicken was my absolute favorite chicken recipe, until I made this one. I absolutely love it!!! Thank you! What type of chicken pieces do you usually use? Thanks! Oh Pamela!! This one is one is a real winner ~ Very easy to prepare and soooo rewarding ~ it’s a keeper! Both my Picky eaters loved this recipe. In fact, my Mr. Picky asked for more. I was concerned that my chicken didn’t brown enough, but it was cooked perfectly and the chopped parsley made for a beautiful presentation. Thanks Pamela, you are the best! I’m so delighted you tried this recipe and more so that everyone enjoyed it! If you are ever need a little extra browning, just set the chicken in the pan under the broiler for a one or two. And I agree, the parsley adds a nice finish! OK, I have to ask: I am on a sodium-restricted diet. Can I still brine the chicken? It sounds wonderful! I don’t blame you for asking! Unfortunately, it’s impossible to know how much salt actually permeates the chicken and stays there and it is influenced by many factors including the absorbency of the meat (which can vary from chicken to chicken), the quantity of salt used, the amount of time the meat soaked in brine, and other factors. If you are on a severely salt-restricted diet, it’s probably best to be cautious and not brine. Otherwise I would ask your doctor. If you wanted to prep this in advance, what would you recommend? Would it be okay to brine and brown and then do the rest later right before serving? Yep, you can definitely do that, but don’t leave the chicken out at room temperature for longer than an hour and 45 minutes. Or make the whole thing, leave on stove covered and then reheat. Same rule applies to leaving cooked chicken at room temp — USDA says 2 hours max. Made this chicken over the weekend. It was delicious the first night and a great leftover to have the next day. My Mr. Picky would have nothing to do with it….his loss! My Mr. Picky just scraped all the “stuff” off the chicken and ate it. Yours will come around in time, too. Until then, more chicken for you! This sounds amazing. Will have to try it. BUT the desserts sound even better! Please make this chicken — it will not disappoint! As for the desserts, yes, better!